Jay Inslee addressing climate strikers at Columbia University last month. In a crowded Democratic presidential field, the Washington governor is staking his candidacy on climate change, making him the first candidate in history to do so. He’s counting on his experience as a state-level executive who has climate legislation wins already under his belt and the rapidly shifting climate policy landscape to propel him to the White House. But while Inslee launched his campaign over a month ago on March 1, he’s still polling below 1 percent, raising questions about whether the U.S. is ready to elect a climate president. To be sure, now is the time for a climate president. And after decades of being relegated to an issue for Patagonia-wearing, hemp-munching environmentalists, the climate is now an A1 political issue. The manifold consequences have become impossible to ignore, as has the dwindling amount of time to do something. And the emergence of the Green New Deal—a proposal to rapidly decarbonize the U.S. economy—has propelled the conversation forward by offering a bold vision of economic transformation required to address the scale of the problem. It’s against this backdrop that Inslee is running. He hasn’t endorsed the Green New Deal, though he has lauded its “aspirational goals.” Instead, he’s calling for a “climate mission” staked on four ideas: transitioning to clean energy, investing in infrastructure and jobs, ensuring a just transition, and cutting fossil fuel subsidies. The ideas and 10-year timeline to implement are in line with the Green New Deal, though Inslee is fond of invoking another seminal American accomplishment, the Apollo moonshot. Inslee has powerful Hollywood dad energy. His blue eyes light up the second before he launches into a joke, which he laughs along to. He makes small talk about the Seattle Mariners. He flips between talking in broad politician-speak, brass tacks pragmatism, and intersectionality, shifting his head from hand to hand as he listens to my questions before leaning out to talk expansively, only to lean back in to make a point. Yet at times, he also seems distracted, getting a distant look that suggests perhaps he’s thinking about a Monmouth University poll of Iowa voters released that morning showing he’s got a lot of ground to make up. We sit chatting in a Midtown hotel the day after a recent CNN town hall, when voters peppered him not just with questions about climate change but healthcare, gun control, and criminal justice reform. Inslee points to the successes of Washington state as a template. 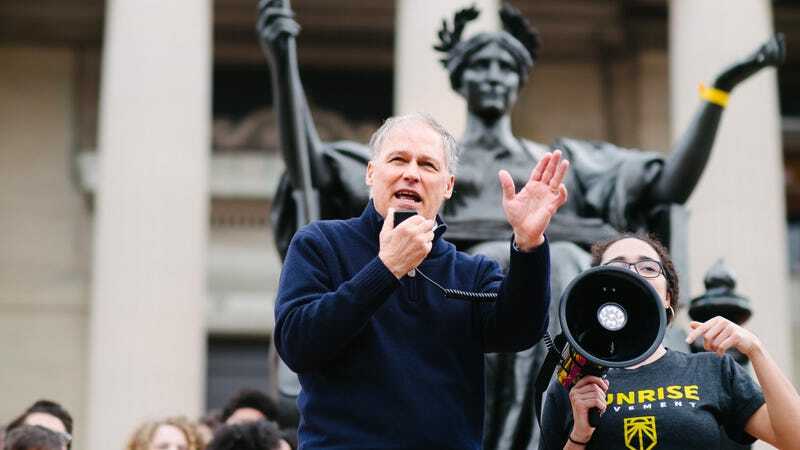 A few days after we spoke, the state legislature passed a bill Inslee championed setting Washington on a path for 100 percent carbon-free energy by 2045. The legislation also includes a provision for funding to help reduce low-income residents’ electricity bills. The state also has a clean transportation bill on the docket—a bill that would start to decarbonize the biggest source of emissions in the state—and Inslee touted a plan to shutdown the last coal plant in Washington and turn it into the state’s biggest solar plant. A $55 million fund would help ease the transition for those put out of work. Inslee knows that on a national scale, Congressional Republicans are likely to fight similar legislation every step of the way. He’s aware that if elected, any comprehensive climate legislation isn’t happening as long as the filibuster is intact. Calling it “an artifact of the antebellum age that is long past its usefulness” Inslee has said he would get rid of it, opening the door to a much more muscular Democratic agenda (assuming Democrats win the Senate of course). Wiping out the electoral college, mail-in voting (which Washington has), and ending gerrymandering among other reforms Inslee sees as crucial for passing climate legislation as well as the basic functioning of democracy. In that Monmouth University poll published the day we chatted, Inslee was polling at less than 1 percent, though two-thirds of voters had no opinion or hadn’t heard of him. That same poll shows that even among voters who rank climate change as their top concern, South Bend, Indiana mayor Pete Buttigieg is in the front of the pack. Even Beto O’Rourke—who has refused to sign the no fossil fuel money pledge and has defended his vote on lifting the fossil fuel export ban—ranks ahead of Inslee. It’s possible that while Inslee’s message lines up well with some voters, particularly younger ones who see climate change as an existential threat, the dad energy that accompanies it might not be right for the moment. It’s telling, for example, that Rep. Alexandria Ocasio-Cortez has been the face of the Green New Deal while her older, white male co-author Ed Markey has largely stayed on the sideline despite having a career focused on climate change just as long as Inslee’s. Or maybe Americans just aren’t ready to take the plunge with a climate candidate. The healthcare system is bankrupting families, 130 Americans die everyday due to opioid overdoses, nearly 110 are killed by guns daily, and the U.S. is mired in a step of perpetual war abroad. There’s a lot of stuff on voters minds and, and while more Americans than ever are alarmed about climate change, asking them to focus on something that still feels far away from the daily lives of most might be a bridge too far. Americans simply might not be ready to make climate change the center of their politics even if the reality is that it will be, sooner or later, since it will require a fundamental economic realignment. Inslee may just be ahead of his time. But when pressed on his low polling numbers, he doesn’t seem outwardly phased.